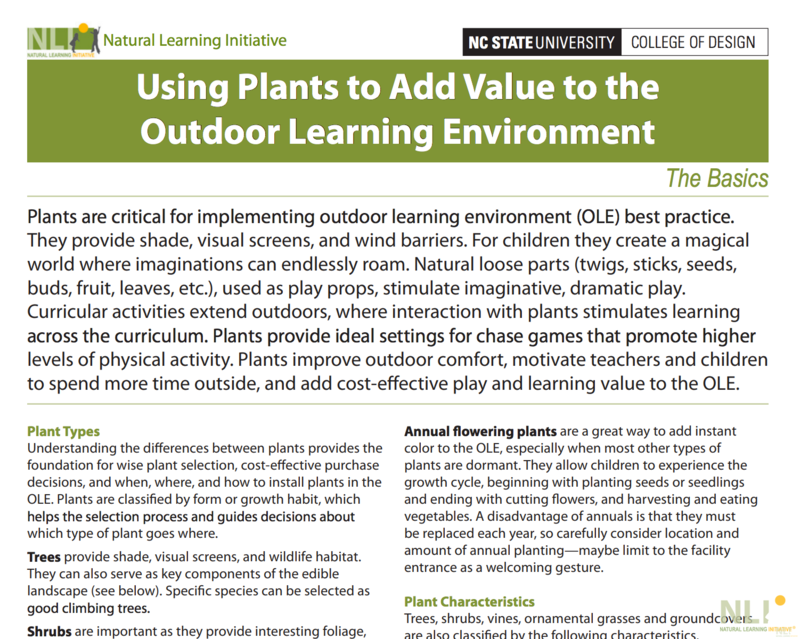 Plants are critical for implementing outdoor learning environment (OLE) best practice. They provide shade, visual screens, and wind barriers. For children they create a magical world where imaginations can endlessly roam. Natural loose parts (twigs, sticks, seeds, buds, fruit, leaves, etc. ), used as play props, stimulate imaginative, dramatic play. Curricular activities extend outdoors, where interaction with plants stimulates learning across the curriculum. Plants provide ideal settings for chase games that promote higher levels of physical activity. Plants improve outdoor comfort, motivate teachers and children to spend more time outside, and add cost-effective play and learning value to the OLE.